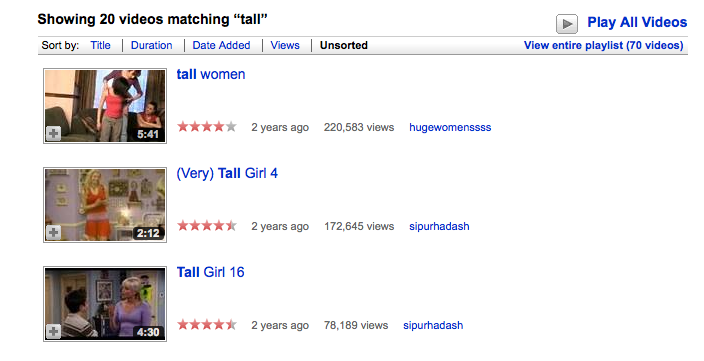 A few days ago, as I was logging onto my professional YouTube account (youtube.com/darcyvillere) I discovered something interesting: all the videos that were being recommended pertained to height. I started the new account to post videos I have shot for companies as part of buzz marketing campaigns so I couldn’t understand why these videos were showing up. None of them were about height and all of them (currently) revolve around videos I have shot for two authors and their new book they are promoting, “I Hate People”. Then I realized, “Oh, my normal e-mail account, which is linked to this blog which is linked to the professional YouTube account.” Makes sense. But what I found that was kind of disturbing was the fact that all the videos seem to be focused on tall women or tall women with short men in some way. But most disturbingly…. they were mostly some sort of fetish videos….errr…. Now, I don’t care what your fetish is as long as it’s relatively safe and all parties are of age and in their right minds to consent to participate in whatever it is you will be doing with each other. (Maybe it’s from years of listening to Dan Savage, idk). But when I look up the word “tall” on a search for YouTube, most of it is still tall woman fetish videos of some kind. Many of which have hundreds of thousands of hits or more. Maybe a more concerted effort needs to be put on us tall folk to make videos that have less to do with fetish and more to do with introducing people to the general awesomeness of our height. Here are a few of the more tame videos. Seriously, just look up the word “tall”.